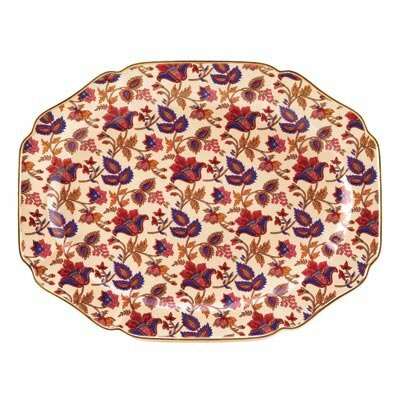 This is for a Jaipur garnet sapphire cream gold rimmed ceramic serving tray from Shopatusm. Vibrant patterns of garnet, sapphire and cream turn any occasion into a royal feast! This classic gold-rimmed serving tray is an appealing way to serve your guests in true Far Eastern style and grace. Weight: 4.2 lbs. 17 7/8 inch x 13 3/4 inch x 1 3/4 inch high. Ceramic.